A hotel chain plans to allow artists to use its buildings as a showcase for arts events. Guest Hotels will create five arts club hotels in London which will host events and provide access to other events across the city. 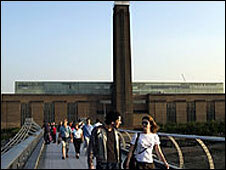 The Institute of Contemporary Arts and the Tate are partners in the scheme. The first two arts club hotels, the Jones and the Nest, will open this summer in Bayswater, west London, followed by three more next year. Restaurateur Oliver Peyton and the Design Museum founder Stephen Bayley are involved in the project. Mr Bayley will be the scheme's style director. Guest Hotels chairman Johnny Sandelson said: "Until now, hotels have used art as decoration. We are reversing that concept by allowing artists to use our hotels as their showcase."